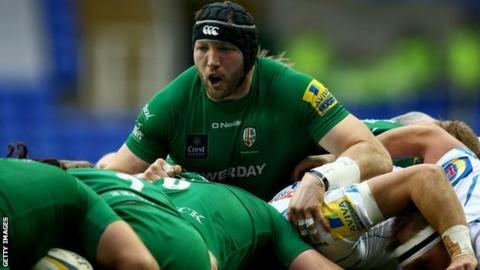 London Irish captain George Skivington has been ruled out for about four months after undergoing surgery on his shoulder. The 33-year-old has made just four appearances since picking up the injury against Harlequins on 25 September. The former Wasps and Leicester second row has been with the club since 2012. "He will be a huge loss. You lose that experience and that knowledge that he has of this competition we are playing in," said head coach Tom Coventry. "As they say, somebody's loss is somebody's else's gain. I think we are going to miss George (Skivington) but Matt (Symons) will step up to that role pretty well," he told BBC Radio Berkshire. Symons, who signed from New Zealand club Chiefs in March, is expected to return to the side after missing the last three matches. The Exiles host Northampton Saints on Boxing Day still in search of their first Premiership win of the season.